More than one million Australians are living with diabetes, and eye disease is one of the most common resulting complications. It’s even possible that some people unknowingly have severe diabetic eye disease before ‘suddenly’ going blind. In fact, diabetes is the leading cause of blindness in working-age adults. Fortunately, most cases of blindness related to diabetes can be prevented with proper blood sugar, blood pressure and cholesterol management and avoidance of smoking. The earlier these conditions are diagnosed and treatment initiated, the better. This affects around 15% of people with diabetes. Persistently high blood sugar levels can damage the small blood vessels (capillaries) that deliver oxygen and nutrients to the light-sensing retina at the back of the eye. This is can range from mild to severe. Capillary damage results in leakage of blood or fluid, causing the retina to swell. Although this stage of diabetic retinopathy usually causes minimal or no changes on vision, if the changes are severe, left untreated they can progress to proliferative diabetic retinopathy. This is the advanced stage of the disease, with growth of new but fragile blood vessels that bleed and can form scar tissue. Symptoms include blurred vision (which can occur suddenly). If these new vessels bleed or a retinal detachment occurs, the person can lose all vision. This occurs if swelling extends to the macula, which is the part of the retina responsible for central vision. Vision can become blurred and colours appear faded, resulting in trouble reading, recognising faces and driving. With good control of blood sugars, blood pressure, cholesterol and by not smoking, diabetic retinopathy can be reversible if it is in the mild to moderate stages. In more advanced cases, with new treatments for diabetic retinopathy, vision can often be at least partially recovered. Treatment options include intravitreal injections (injections into the eye), laser treatment and surgery. Subscribe to our weekly newsletter and receive useful health tips and insights, expert advice, offers and promotions straight to your inbox. Subscriber now and receive the Eat Clean recipe book FREE with 20 recipes to get you started on your healthy eating journey. Sign up to our weekly newsletter and receive useful health tips and insights, expert advice, offers and promotions straight to your inbox. Receive the Eat Clean recipe book FREE with 20 recipes to get you started on your healthy eating journey. 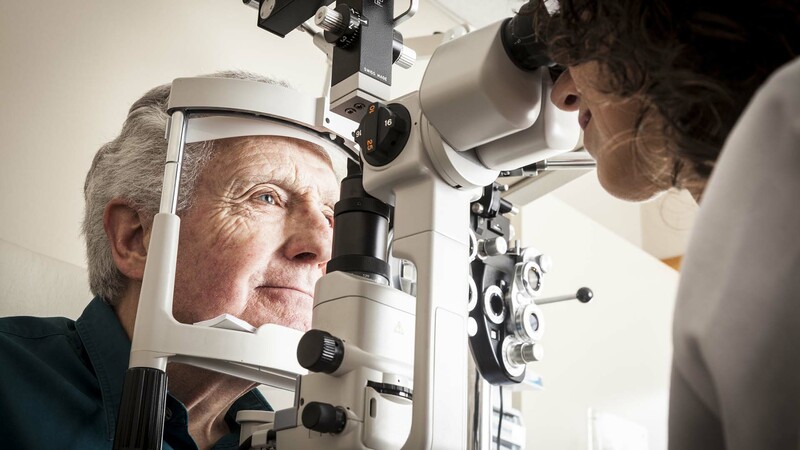 People with diabetes are much more likely to develop cataracts at an earlier age, with faster progression to visual impairment and possibly blindness. Symptoms include blurred, clouded and dim vision, faded colours, reduced night vision, sensitivity to light and glare, seeing halos around lights, and a frequently changing lens prescription. Cataracts can be fixed surgically and sight restored. In fact, with the latest technology your vision may end up better than it was before the cataracts. This is a group of conditions that damage the optic nerve, which transmits signals from the retina to the brain. The risk of glaucoma in people with diabetes is nearly twice that of the general population. Open-angle glaucoma. This is the most common form and usually progresses slowly, with a gradual deterioration in peripheral vision. The disease is quite advanced by the time vision loss is noticed. Angle-closure glaucoma. Symptoms are more noticeable as they develop quickly. Acute symptoms include a sharp increase in eye pressure, eye pain, headache, nausea and vomiting, blurred vision and seeing halos/rainbows around lights. This condition is an eye emergency and needs immediate treatment by an ophthalmologist to prevent blindness. Unfortunately, vision loss due to glaucoma is not reversible. Instead, treatment is aimed at stabilising the course of the disease. Options include medication, laser treatment and surgery. Everyone diagnosed with diabetes should have an initial test to check for signs of eye disease. Your eyes should be checked on a regular basis, usually every year, or as recommended by your ophthalmologist.